Meet another new (to me) dress that I'll be wearing all summer. I just got this dress in from a Facebook swap, and it's such a great, easy piece to throw on. And guys, it's covered in fans, which is probably, like, the third cutest print I could find behind little animals and bicycles. Okay, not really, but I'm in love with it regardless. My only regret is that I didn't think to wear my fan necklace with it, but we all make mistakes sometimes. Mine are just limited to forgetting to match my accessories to my outfits. Other than that, I'm perfect. I actually wore this dress for the first time to Balboa Island with my friend Jon on Saturday, but I didn't get any pictures. Fortunately, my friend Alena was kind enough to spend yesterday afternoon traipsing through Orange County with me to find spots for outfit photos. I got a new lens, which I'm very excited about, but taking pictures in my backyard with a tripod can only stay interesting for so long. We ended up taking a couple of sets, and I'm especially smitten with this set taken at a park not too far from us. I had only been there once a long time ago, so I was hoping it was just as pretty as I remembered when I suggested it. As much as I'm hoping to not stay in Orange County for too long, I'm definitely starting to realize just how little of it I've actually seen. It really is a cool place to grow up, and I'm hoping to explore my hometown even more while I'm here, for however long that may be. While you're here, make sure to enter my two-year anniversary giveaway for a chance to win prizes from seven amazing small businesses! Other than working and going to Balboa this past weekend, I also drove two hours with my friend Adam to Edwards Air Force Base. One of my oldest and best friends, Kyle, is working tech for Tops in Blue, the sector of the Air Force that travels to all of the bases to perform for the troops and increase morale. I've known Kyle since we were 12 or 13, but I hadn't seen him since Thanksgiving (only for a day then), and I won't see him for probably another year while he's traveling the world. We got to see the show he's been working on, hang out with his family (whom I love), and spend some time with him before he left for the next base. It's a little strange being at that age where my friends are starting to drift to other places (especially in his case), but it's nice to still have such a tight-knit group that we still make it possible to see each other. Not that we're all that nice to each other when we do see each other, but the sentiment is there. So, this might be an odd thing to focus on, but I like that first picture. Something about the pose makes you look look a bit different. Taller maybe? And the way your shoulder is back to you can lean your arm on the railing looks so relaxed. I can't believe you didn't wear a coordinating necklace. What were you thinking?!?? That's it. We can't be friends anymore. Actually on second thought, I'm too boring to make new friends, so I guess you can stay until I find a proper replacement. In the same way that you replaced/fired/graduated me. Yep, awesome dress! 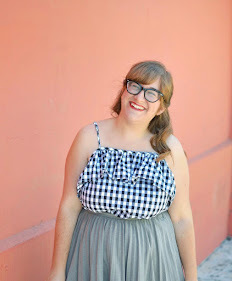 I love dresses that are easy breezy to wear like this! The print does all of the work! Love love love! These photos are gorgeous. I agree with Kristian that the first one is especially nice. Glad to hear you've been getting some good exploring in and I'm happy to hear you got to catch up with your friend! I love that dress! Especially with the shoes! That dress is so adorable! What a great swap piece! Hope that all is well with you and you are enjoy your CA time! This dress is ridiculously beautiful and those shoes were made for it. You're always going on such cool adventures, forever jealous. I love this print and those shoes are just too adorable.